Microalgal biomass production has been investigated since the 1950s by academic and industry sectors due to its potential and for biodiesel production. One of the main bottlenecks in microalgae production is biomass recovery and its separation from aqueous medium. For this reason, the use of a flocculation process is an important step to promote microalgae recovery in large scale. Here we provide a strategy for the harvesting of microalgal biomass using chitosan as flocculating agent in pilot scale cultures performed in flat plate photobioreactor. The results show that chitosan was effective in inducing microalgae flocs and separating them by settling. In the jar test scale the best clarification efficiency was around 99% and when scaled up using a 100-L photobioreactor, the biomass recovery efficiency was close to 98%. Comparison of the compositions of biomasses obtained by flocculation and centrifugation indicates no significant differences in terms of carbohydrates, proteins, lipids, and ashes, showing that the flocculation process is not affecting the biomass characteristics and its potential biotechnological applications. Based on the presented results, flocculation using chitosan as flocculant agent can be considered as an efficient method to harvest Desmodesmus subspicatus biomass cultured in pilot scale photobioreactors. DOC acknowledges CNPq for a doctoral fellowship. MRD and MDN are Research Members of CNPq. 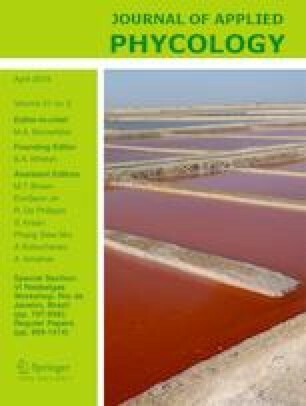 The authors wish to acknowledge the Elizabeth Aidar Microalgae Culture Collection of the Fluminense Federal University (UFF) for the kindly supply of the microalgae used in this work. In addition, we are grateful to the Electronic Microscopy Center of the Paraná Federal University (CME-UFPR) for the SEM analyses. This work was financed by the National Council for Scientific and Technological Development, CNPq, Brazil (project nos. 403869/2013-7 and 462414/2014-0).